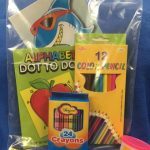 These bags of fun, craft gifts are sure to brighten the day for children in after-school programs, summer camps, or schools. Add a note wishing them a fantastic summer. Let’s help bring smiles to other children in need by recognizing how easy it can be to make a difference in their world.